Former Liverpool midfielder Jay Spearing believes the entire city would be lifted if the Reds end their 24-year wait to win the league title. Brendan Rodgers' side are five points clear at the top of the Premier League. 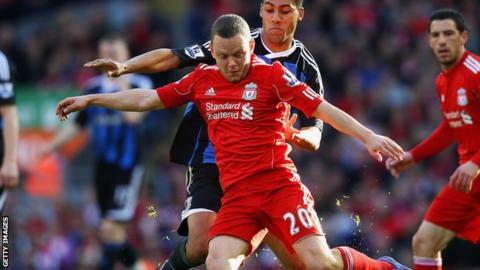 Spearing, who made 55 appearances for his hometown club, left Anfield at the start of the season to join Bolton. "Not just the fans, but the whole city would be on a high for a year. It's been a long time coming," the 25-year-old told BBC Radio Manchester. "The club should have been in the Champions League year-in and year-out. "They're now slowly getting back to where they belong, and if they can win the title along the way, that would be tremendous." Victories over Chelsea, Crystal Palace and Newcastle in their final three games will see Liverpool crowned champions of England for the first time since 1990. He added: "I've got everything crossed for them to go on and win the league. Every single one of them deserves it, especially [captain] Steven Gerrard."